What do those numbers on the tire's sidewall mean? Which custom wheel will fit my new truck? Can I get historically correct tires for my vintage Mustang? 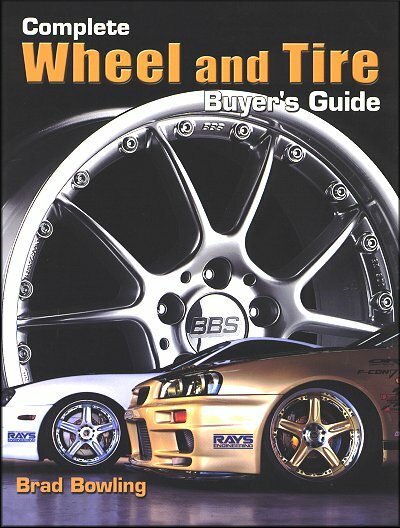 The Complete Wheel and Tire Buyer's Guide is the definitive reference for car, truck, and SUV owners seeking new tires and/or wheels. Author Brad Bowling provides an entertaining education on the proper selection of tires and wheels for any vehicle. Chapters devoted to tire history, deciphering sidewall numbers, tire care and maintenance, wheel construction, and wheel types take away the mystery of purchasing new wheels and tires. The Tire Brand Directory and Wheel Brand Directory contain listings of all major tire and wheel manufacturers in the U.S., describe their products, and include Web site and contact information. This practical reference allows vehicle owners to make the best decision possible on the selection of new wheels and tires. Are you customizing a Mitsubishi Eclipse, looking for a set of Davin spinning wheels for your Cadillac Escalade, restoring a vintage vehicle, or buying a new set of tires for your family sedan? This guide is the place to start. Ask a question about Complete Wheel and Tire Buyer's Guide.